Soundwave week has begun, bringing an array of heavy and alternative international bands to Australian shores. Today Sydney play host to the festival, with sideshows from many of the bands to be hosted in both Sydney and Melbourne during the week. This years festival is marginally smaller than 2013, which was headlined by the biggest name in heavy metal; Metallica but it seems it hasn’t made the gig any less exciting. 2014 brings big name acts such as Avenged Sevenfold, Rob Zombie, Korn and headliners Green Day to our shores among others. As soon as the gates opened to Brisbane residents yesterday reports of the good and the bad surfaced across the internet. Headliners Green Day finished 20 minutes early and difficulties with sound saw Rob Zombie arrive on stage almost 15 minutes late. Of course, the biggest news coming out of the event wasn’t the technical difficulties or set. According to news sources the band encouraged the audience to jump security lines and get on the stage with them. Event organizer, AJ Maddah tweeted not long afterwards that the band would be excluded from the rest of the tour. Many have criticized the move by AJ, while some have criticized the band for their appalling behavior and others have heralded their nerve. I understand that another tweet by Maddah has suggested he has amended the decision of removing the band from the festival after discussions were held. It will be extremely interesting to see how the incident plays a role in Australian bands joining the tour during future festivals. While this years Festival is still in its early days, it seems it’s already making significant waves across the country. Punters in Melbourne, Adelaide and Perth will attend the festival next weekend, with many pictures of bands playing in Brisbane and Sydney already circulating around the net the excitement is far from over. 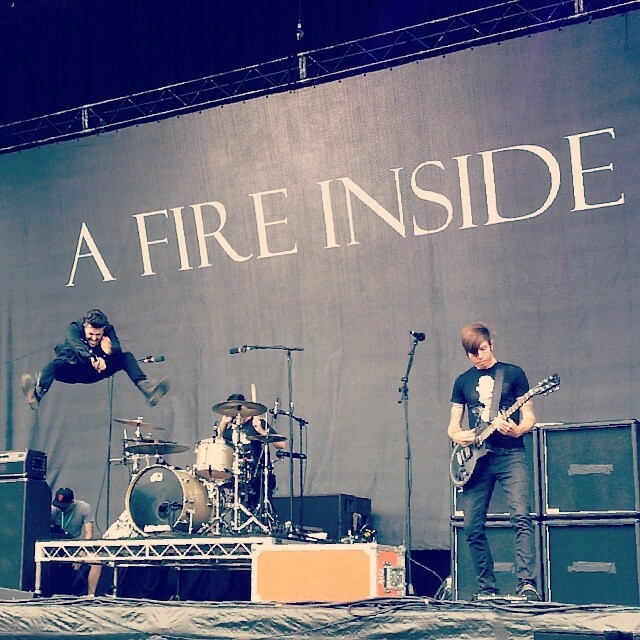 A picture captured by a friend during the AFI set at Soundwave Festival in Brisbane. I’ll be attending the festival on Friday in Melbourne, so stay tuned for a report on how the event goes down!